Dubai: Union Properties will regain cash flow stability from the series of new projects it has taken on at the 3.5 million square metre Motor City master-development, according to a top official. These include a new residential project (unveiled on Sunday) and a four-star hotel, while its retail components such as The Ribbon are complete and in advanced leasing. UP, which had seen a decline in 2015 revenues and profits, has also been scoring on other fronts. Dubai Investments picked up an additional 20 per cent in Property Investments, its joint venture with UP and developer of Green Community. This way, UP secured Dh98 million. Meanwhile, Motor City’s prospects have won a major boost after AGMC, the local BMW dealership, confirmed a Dh200 million showroom and after-sales facility alongside “Detroit Road”, Motor City’s main commercial thoroughfare. All of the individual components will crystallise around the Autodrome, the multipurpose racetrack and main attraction. Motor City is home to more than 30,000 residents, in locations such as the “Green Community” and “Uptown” clusters. Prices as of end 2015 hovered in the range of Dh900-Dh1,100 a square foot. To this has been added the “Oia Residences”, its first residential release there in over two years. 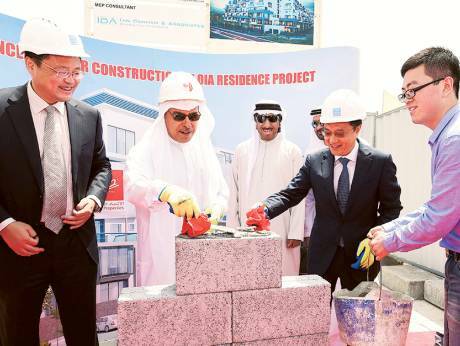 Construction has started on the Dh442 million project — which will add a further 269 units — but senior UP officials said the sales will not happen immediately. Instead, they will be taking cues from the how the wider market has been faring and then time the release accordingly. As of now, 75 per cent of the plots available at Motor City have been taken up. Senior spokespersons also confirmed that for the remaining they might do some minor changes to the master plan to be in sync with market demand. “We are seeing demand for commercial locations in secondary locations of the city,” he added. One of the world’s largest construction companies, the China State Construction Engineering Corp (CSCEC), is open to taking new equity stakes in projects in the Gulf. It has already done in two projects it is working on in Dubai, the “Viceroy” developments — at the Palm and Jumeirah Village — being built in tandem with Skai Holdings. It has a minority stake in both. Even without the equity stakes, the contractor has an order book of $3 billion plus in the UAE, with Kuwait following with another $1 billion. Among the UAE projects is Oia Residences — valued at Dh200 million plus — for Union Properties. On the Palm, the Chinese company is working on four upscale hotel properties.